Summer is officially just one day old and we have a beautiful evening here on the west coast of Ischia. The night sky is full of stars, the temperature is somewhere between warm and cool, enough to be able to comfortably wear a t-shirt but not too much so that it's too hot. Outside there's the eclectic musical sound of the omni-present feint barking dog mixed in with the sound of vespas, music coming from one of the hotels down in Citara bay and the odd firework thrown in for good measure., creating a cheerful backdrop to the natural jewels glittering from above. It's been another busy week, not just on the Ischia Review side of things but also with a very welcome family visit during the early part of the week. Unfortunately that visit coincided with by far the worst weather we'd had for more than a month. 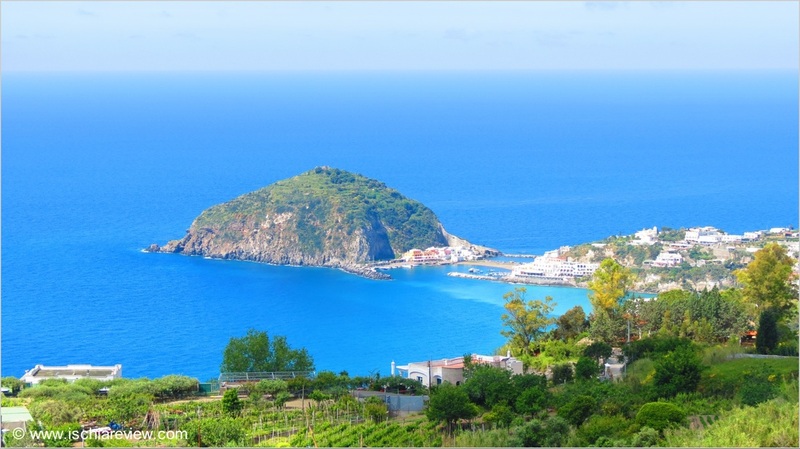 A monsoon-like rain greeted my visitors as they took their first steps on Ischia and they must have felt as if they were back home in London for the first 24 hours or so as about six week's worth of water was emptied on to the previously bone dry island. The deluge eventually abated and we were then able to see the very best of what the island has to offer with a guided tour by road, followed by a visit to Poseidon Thermal Gardens in Forio. That was my first visit to Poseidon this year and in fact my first "bagno" (swim) of the year which was absolutely fantastic. We took advantage of the cheaper entrance price of €17.50 after 430pm and just about managed to take a dip in each of the twenty or so pools, including the very strange Kneipp bath and Japanese pool where you alternate between 15° and 40° Celsius water in quick succession in order to aid your circulation. My second swim of the year came this afternoon at a busy Citara beach which was followed by a spectacular sunset on what is one of the longest days of the year. Yesterday was the summer solstice meaning we're enjoying the longest hours of daylight for the whole year with the sun rising at 05:31 and setting at 20:39, a good 15 hours and 8 minutes of glorious sunshine! Speaking of sunshine, the weather forecast for the coming week is looking very settled with temperatures ranging from a comfortable 20°C (68° Fahrenheit) in the evenings up to a steamy 30°C (86°F) during the hottest part of the afternoons. Looking ahead to next week there are a couple of interesting dates to keep in mind. The first of those is Tuesday 24th June, known as San Giovanni in Italy but it has a special significance in Forio. For many years, the children of Forio have been taught not to swim in the sea on the 24th June as it will be full of swords. This dates back to a legend from medieval times which refers to a battle that took place between the people of Forio and raiding Saracen pirates close to the town's shores. Ischia and Forio in particular, was repeatedly attacked during those times and there is still evidence of those raids today with the 14 watchtowers that were built in an attempt to repel the marauding pirates. The second important date for next week concerns the slightly less cut-throat world of the movies (see what I did there?). Ischia's movie history is well-documented and from next Saturday 28th June it comes to life again with the Ischia Film Festival. The festival unfolds around Castello Aragonese in Ischia Ponte and comes with a program of events including exhibitions, screenings, film workshops, conferences and much more with distinguished guests from around the world making a bee-line for the island to be part of the action. The festival lasts until the 5th July and is quickly followed by the Ischia Global Film & Music Fest which starts on the 12th July. Ok, thanks for reading and remember we're here to help with any queries you may have so feel free to get in touch.